I had chicken breasts in the refrigerator ready to go and had to figure out what I was doing with them using ingredients that I had in the house. I had lemons, garlic, even had fresh rosemary in the house. I really threw this together and the next time out I would use thin chicken cutlets or pound the ones I had thinner. I used 1 package of cutlets for the 2 of us, which is usually around the 1 lb. mark. This recipe would be perfect for 1 lb. of chicken cutlets. Double up for 2 lbs. As I said this was a very thrown together recipe. I tried to keep track of what I was doing so I could duplicate recipe. It is one of those recipes that you sort of wing as you go. We really enjoyed this chicken and I hope you will too. Whisk together in a large bowl the olive oil, lemon juice, rosemary and 1 tsp. kosher salt and 1/2 tsp. freshly ground black pepper. Place chicken cutlets into bowl and place in the refrigerator for a 1/2 hour. Remove chicken cutlets from marinade and place on a plate, discard the marinade. I sprinkled a little more kosher salt and pepper on the top side of chicken (shiny side) . Then dredge lightly in the flour, you should have more than enough flour with 2 Tbsp. but if you need more you can add it. Tap Breasts after you dredge to remove excess flour. Turn oven on low or a warming drawer works well here , just to keep chicken warm after you cook it on stovetop. Heat a large skillet over medium to high heat and add grapeseed oil. When oil is very hot, place one or two pieces of chicken in the pan–don’t crowd. Cook for a few minutes on each side, (try not to overcook or the chicken will be very dry) just until you see it browning up, this is why the thinner chicken works best here. Transfer to a plate and blot the chicken with paper towel. Cook all the chicken. I placed chicken on a baking sheet and put in the oven/warming drawer while I cooked the mushrooms. Turn burner down to medium high heat , add mushrooms to the pan and sprinkle with a little kosher salt and pepper. Let them sear for about a minute without touching them, then stir , scraping the bottom of the pan with a wooden spoon. When the mushrooms start to soften add the wine, chopped thyme, and you can taste for salt and pepper. Continue to stir the mushrooms until the wine has evaporated and mushrooms are tender and ready , app. 10 minutes. I removed chicken from oven , plated it up over basmati rice and added the mushrooms over the chicken. That’s it and it was delicious. Yes, I read and subscribe to Gwyneth Paltrow’s website Goop and when she’s not explaining her “conscious uncoupling” the website is actually very informative and worthwhile. In any event her suggestions for recipes are very worthwhile. 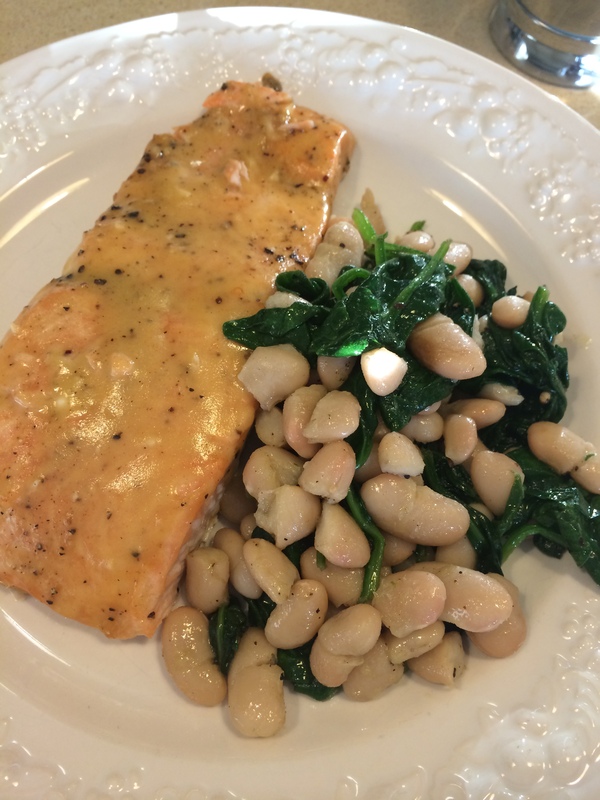 This recipe was on the Goop website and even though you have to roast the garlic which is a little time-consuming it was a super delicious dressing and I actually put it on Salmon before I broiled it and it was really tasty. The recipe is from Roberta’s Cookbook which actually looks pretty amazing. I always have all these ingredients in the house and they are simple ingredients . I have to admit the first time I read it I was thinking of omitting the roasted garlic but it wouldn’t have been as deeply layered a flavor. 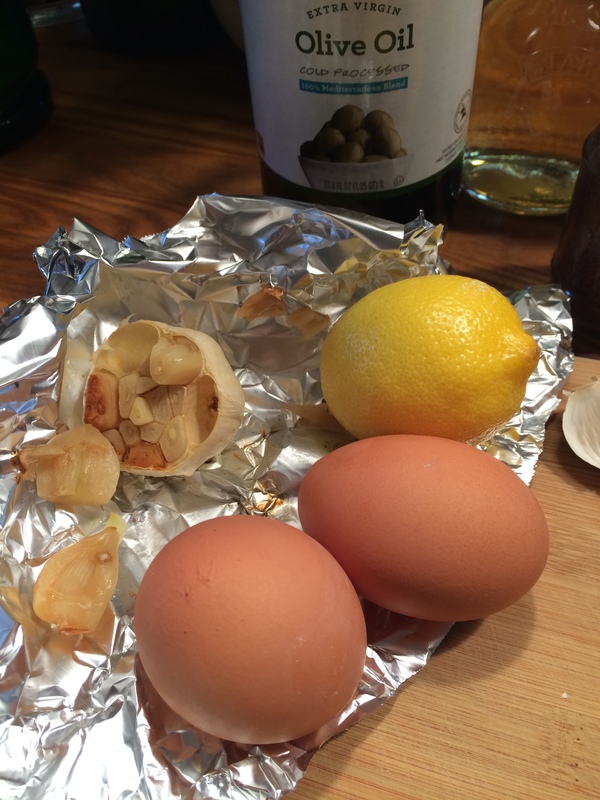 I highly recommend this recipe and roasting the garlic , we fully enjoyed our salad. 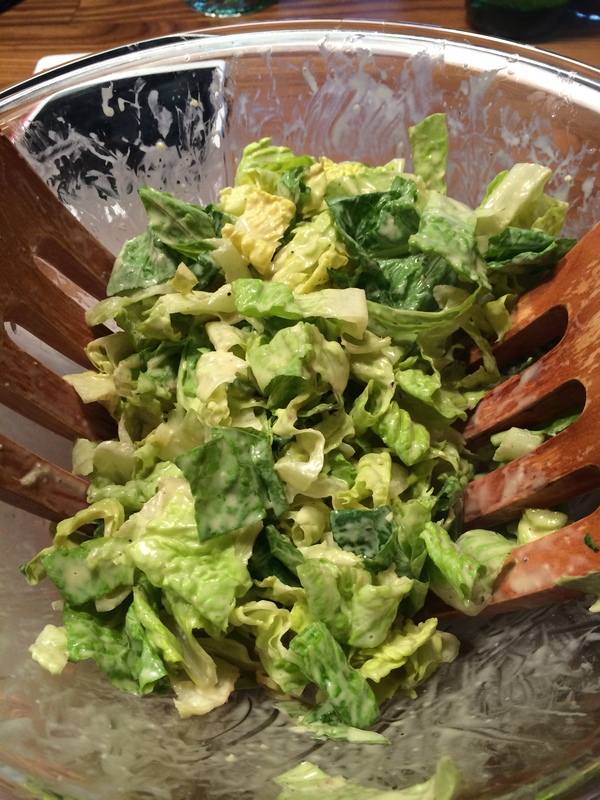 I used plain Romaine this time out but this would be amazing on any greens. 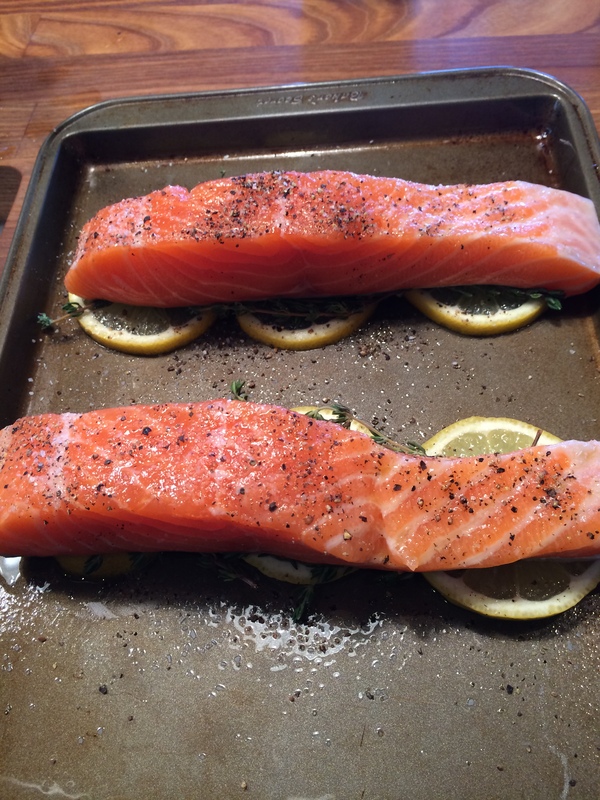 I also used it on my broiled salmon a few days later and it was amazing. I broiled the salmon on lemon and thyme brushed the dressing on it put it back in broiler for about 5 minutes and it was delicious. 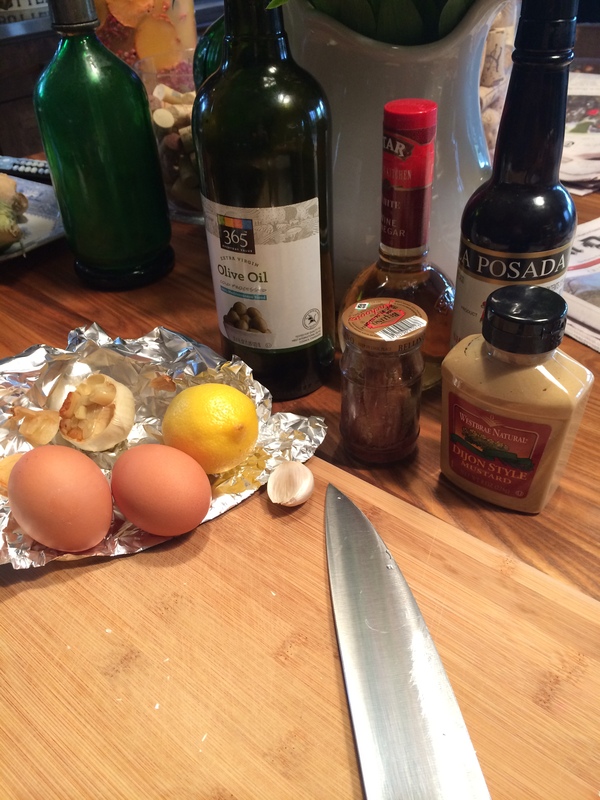 So not only a great salad dressing but an awesome marinade as well. This was my adaptation. Preheat the oven to 350 degrees. Cut about a quarter of an inch off the head of the garlic and place the head cut side up on a piece of aluminum foil large enough to cover garlic. Splash a little water and a splash of olive oil over the whole head of garlic. Make a loosely wrapped little package with the tin foil. I baked for one hour. Remove the garlic from the oven and let it cool down. Squeeze out 4 – 5 cloves depending on how large they are you’ll use less or more. 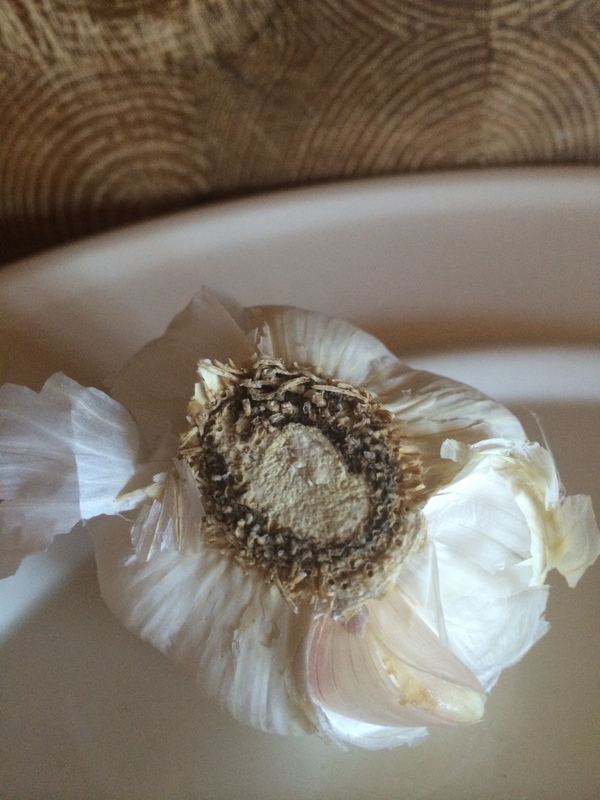 Set aside extra garlic to use as a spread if you like. Your house will smell amazing. 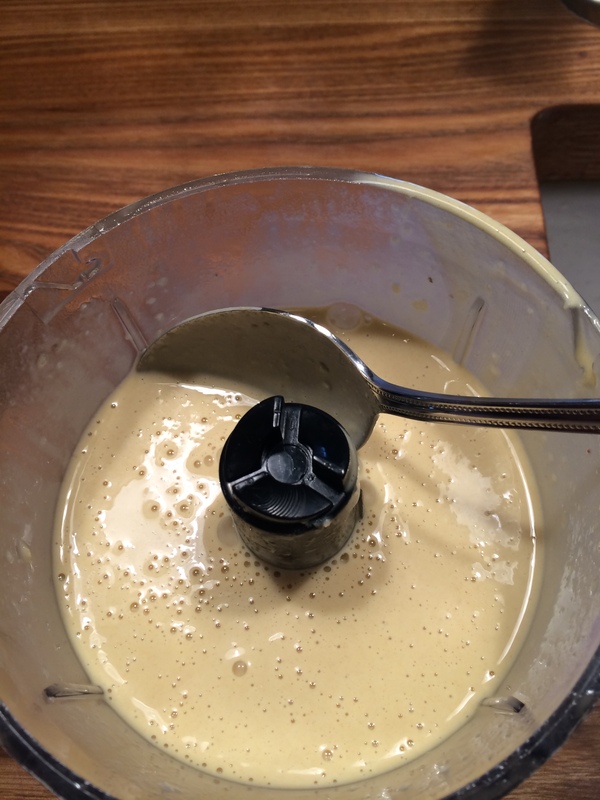 Place roasted garlic cloves, the raw clove of garlic, mustard, vinegars, egg yolks, anchovies and lemon juice into a blender or food processor ( I used a mini food processor) Blend till well combined. 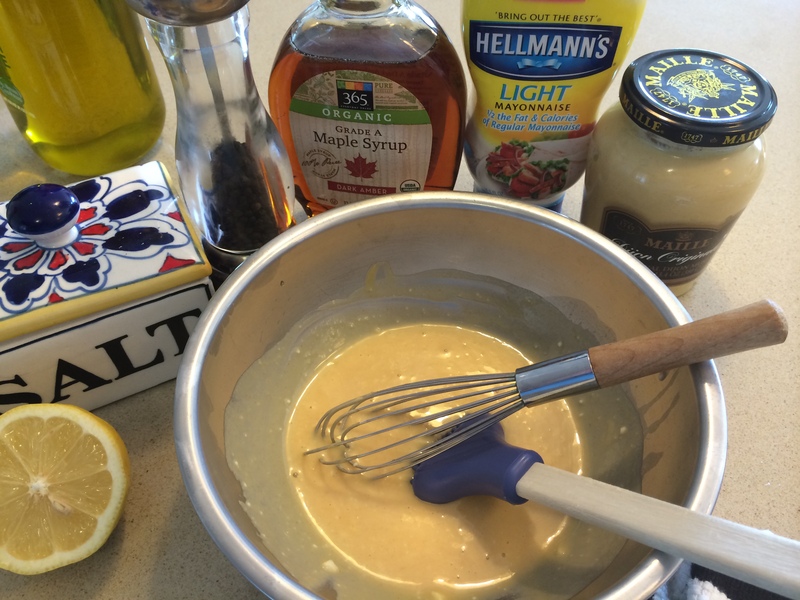 While blending, add the olive oil in a slow steady stream until it’s incorporated and dressing looks smooth and creamy. Taste for salt and pepper . Dressing will keep in refrigerator for a week. Because of raw eggs I wouldn’t keep much longer than that.